Today's bike of the day is brought to you by the lovely folk at Len Manchester Motorcycles. 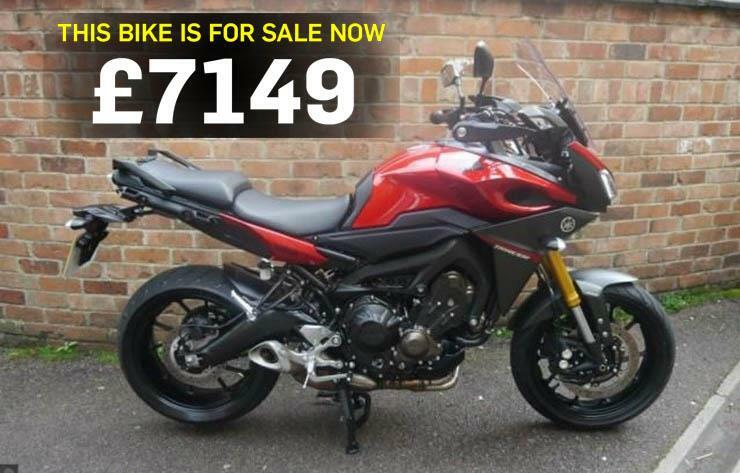 "YAMAHA MT-09 TRACER, 850cc , Manual 6 speed, 2016 16 Reg, 461 miles, Red (Lava Red), Data Tag, Immobiliser. This Ex Demo is a stunning example of the much sought after Tracer. This bike has been registered to us here at Len Manchester to use as a demo. "This bike is in immaculate condition and has only covered 461 miles in its time with us. The Bike will come with 3 keys, YISS Imobiliser, Center Stand, ABS, Side stays, data tag and much more. This Tracer will also come with the remainder of it 2 year unlimited mileage warranty and the remainder of its 1 year R.A.C Breakdown cover. For any further details on the bike feel free to call a member of our sales team on 01664 562 302 £7,149 p/x welcome." Currently Len Manchester, a Yamaha Premier Dealer, are celebrating their 70th Anniversary at their branch, Melton Mowbray LE13 1AE. And for more information on this dealer, visit their website. Motorcycle Live 2016 presents: Love it? Live it!